Fluidra wants to turn swimming pools into arcades. Imagine searching for virtual treasure, exploring sunken ships, swimming with sharks and seeing the surrounding landscape transformed into a lush jungle with a massive waterfall spilling into a real-world pool. That’s the idea behind Fluid Reality, an augmented reality program being developed by Fluidra. The Barcelona-based pool equipment manufacturer has a prototype for an AR headset that can be worn under water for immersive gaming experiences. Picture a cross between Marco Polo and Pokémon GO-style game play. “The games we seek to create on this platform will be similar to Pokémon GO, in a sense that they will be interactive and fun, but also educational and healthy,” says Marc Tarradas, a lighting equipment design engineer at Fluidra. Conceptual Fluidra - Imagine Phase 2 from Imagine on Vimeo. The project got underway earlier this year, when Fluidra challenged employees to develop a new way for people to enjoy swimming pools, preferably something internet-driven and interactive. Tarradas’ idea of a waterproof video game system was the clear front-runner. “It opens new ways of business for the company and is a big step forward to apply the emerging technologies to the pool sector,” says David Tapias, director of research and development. VR and AR indeed are big business. Consumers are expected to spend $143 billion on the technology by 2020, according to market analyst International Data Corporation. The Imagine Creativity Center, a business incubator that fosters disruptive technologies, invited Tarradas and his team to spend a month in Silicon Valley to further develop the idea. The first order of business: See how existing AR technology, specifically the Microsoft HoloLens, performed under water. For that experiment, developers received an assist from Sub Sea Systems of Diamond Springs, Calif., which makes diving helmets for underwater walking tours. But the HoloLens, on loan from the Imagine Creativity Center, was too bulky to wear under the headgear. The $3,000 mixed-reality glasses had to be dismantled to fit. Once submerged, problems became apparent immediately. Issues with glare and refraction made it difficult to see and interact with 3-D holograms. So the team designed goggles with a larger, flatter viewing pane and external sensors to bring virtual images into sharper focus and better respond to players’ gestures. 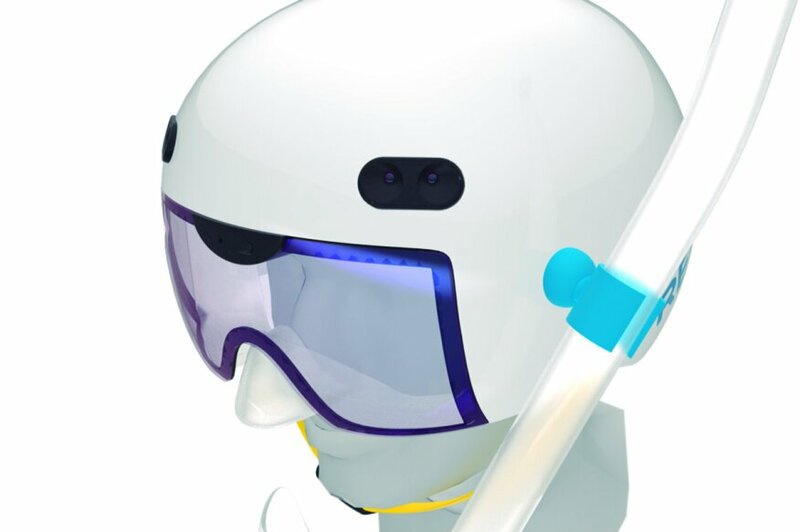 The AR glasses are incorporated into a protective helmet — these games get physical — which includes an oscilloscope to track movement, orientation and position. The software includes parental controls, allowing Mom and Dad to send messages via cellphone to distracted kids. Developers also envision that content for Fluid Reality would be available for download in an open marketplace. This article was originally written by Nate Traylor and appeared here.